I posted a while back about starting a small project that turned into a much bigger one & would need its own post; well, here it is! It all began because I wanted to learn how to do shisha mirrors and indian-style embroidery. Then I found a beautiful book called Indian Inspirations by Gisella Thwaites, which truly is inspiring! Full of lovely embroidery and patchwork techniques (including shisha) and some funky patterns and projects too. One of which is these little embellished elephants. What better way to practice my shishas than to make an elephant?! So! Elephant No 1: This was my first go at crazy patchwork and I stupidly forgot to add seam allowances around the outside edges, so he’s a bit tatty around the seams! Also my first every shisha mirrors: my foundations & stitches are too loose – you can see the top mirror is hanging out and the second one fell out and had to be replaced with a large sequin stitched into place instead. Time for another go! Elephant No 2: I remembered to add seam allowances this time, but the trunk still came out a bit wonky! I’m pleased with my newly-learned stem stitch and feather stitch and my shishas are much more stable, but I’m not happy with how uneven they look. A bit of online research led me to the wonderful resources on Sarah Homfray’s site, which includes an excellent video tutorial on shisha embroidery. Elephhant No 3 (pre-stuffing): and with 1 &2 for comparison: Elephant evloution! I’m very pleased with this one! I had such fun playing with different stitches and adding beads, sequins, etc. I seemed to get more ambitious with each one I did! But three was enough; the original project in the book was to make a single hanging elephant with beads and bells, but MORE IS MORE, right?! Aaah, sooo cute! They’re hanging in my bedroom window now. I’ve become more than a little obsessed with Folk Art quilts this year! 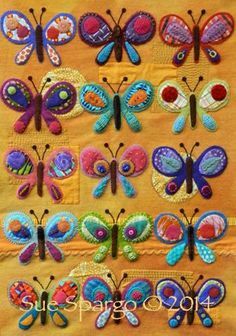 Wendy Williams, Kim McLean and Sue Spargo are among my favourite quilt artists (see my Pinterest board for more) – I love their quirky, colourful designs and the way they combine different techniques, using combinations of patchwork, appliqué, embroidery, embellishment and quilting. A few months back I treated myself to books by Sue and Wendy, with the intention of Having a Go. However, as mentioned in previous Adventures, my first foray into the world of hand-sewn appliqué was less than brilliant! Whilst browsing the recent Craftsy course sale however, I discovered there’s one with Sue Spargo herself! It’s all about hand stitching, using embroidery techniques to embellish and add texture to appliqué work. I’ve never done one of these online courses before, but this one is very well put together and presented in well-shot, quality videos (no they’re not paying me, I really did think it was good!). I’ll admit to having to pause and repeat LOTS of times for certain things, and I certainly needed plenty of practice, but the instructions were very clear and you could see exactly what was what. Unlike some of the other Craftsy courses this one focuses on just one main project, a ‘sampler’ appliqué panel using Sue’s butterfly design. Having gathered myself some lovely threads and fabrics (I even had a go at making some of my own felt – see bottom left of the pic below), I launched straight into a smaller version of the butterflies! First mistake: I didn’t zig-zag around the edge of my wool base fabric and it soon began to fray horribly! As you can see from this bit of butterfly detail, there wasn’t much edge left by the time I got it under control… you’d have thought I’d learned my lesson last time, huh?? Sue’s layering technique begins with a wool fabric background to which toning fabrics are added for texture; she then hand stitches wool felt appliqué shapes in contrasting colours on top. Further layers of fabrics, wool, embroidery, beads, etc are added onto the appliqué to give further dimension and texture. So this butterfly wing, for example, has a layer of (non-wool) felt in purple, a hand-turned greeny-yellow cotton on top of that, then circle of purple velvet on top of that; then I’ve used embroidery silks, perle cotton, and a sparkly purple heavy acrylic thread to do the various bits of embroidery. It was so brilliant, watching these little butterflies build up from plain shapes, taking on more and more character as I added the different elements! Here’s more of Mr Purple This pink & orange beauty was my first butterfly, and as you can see my stitches got neater as I went around the outside edge from right to left, and also as I worked my way up through the layers! By the time I came to do the last little details on the inner circle of this wing (a Palestrina knot edging and some Drizzle stitches) I felt like I was starting getting the hang of things! And here’s the rest of Miss Yellow I’m particularly chuffed with the emboridery on the centre body of this one! It was a such a gorgeous project to work on, and I loved playing around with all the different fabrics, beads, and threads. I’ll admit that some of the stitches on the course I really couldn’t get the hang of, and a couple didn’t interest me that much so I didn’t bother with them. I also made myself a little ‘stitch reference’ guide to keep on my laptop – I did find it a bit of a pain having to go back to the video every time I needed to remind myself of any tiny thing. A couple of other people had commented about this too, so maybe Craftsy will include a stitch guide in future. I made mine into a mini-sampler, and it was a handy piece to use as practice for quilting through the wool fabric. To be honest, I didn’t think it added much to it and the fabric didn’t hold up that well. In fact I was umming and aahing about whether to quilt the finished butterfiles at all…. You see, by this time I had spent many, many MANY hours on this little sampler, and it had turned out so much lovelier than I had ever expected … …that I wished I had used a better quality fabric for the background, plus I was a bit scared that it would fall apart completely if I machine quilted it! But as it stood I thought the background looked a bit tatty. So after much pondering, I decided I would HAND QUILT it. Yes, my Hand Stitching Confidence really has improved thanks to this course! I also found this video tutorial by Sarah Fielke very helpful. Much better! I really think the quilting has ‘lifted’ the whole thing. So all that was left now, was to add a binding. And before you say anything, yes, I could do with a whole other course on that! But here it is, anyway, the result of several weeks’ worth of stitching… WHOO-HOO!! I LOVE it! It’s so colourful and sparkly and tactile! And apart from the Emergency Unravelling Prevention zig-zag round the edges, EVERY bit was sewn by hand! So I have definitely achieved my aim, of improving my hand-sewing skills. Yay! Plus I have a VERY groovy thing to hang in my living room! Hello Lovely Blogosphere folk! Oh, I have been trying to write some posts to share with you for weeks, but ever since the Kington Show last month I’ve been in a bit of a ‘creative slump’ it seems. I spent so much time and effort crocheting and making things for the stall in the run-up to the show that I’ve felt like I needed a bit of a break – or a change at least. The thing I most enjoyed making for the show was our Phoenix Crafts appliqué banner, and if you follow me on Pinterest you’ll probably have noticed I’ve become a bit obsessed with appliqué lately! I’d had the idea for Mr Phoenix in my head for quite a while, and had been gathering fabrics and threads from far and wide (the main two came from this lovely shop in Devizes way back during my hols in July!). As with the Psychedelephant Quilt I was using quilting cottons, so I ironed fusible interfacing to the back of them to prevent fraying. At least, that was the theory… Once I’d drawn the basic design I made freezer paper templates for the larger pieces, then cut & pinned these into place. I then began hand-stitching the ‘flame-feathers’ into place using fine embroidery threads and small running stitches. My intention was to make a raw-edge appliqué that I would then machine to the background. Once the main feathers were on, I cut a lot of the smaller pieces freehand, fitting them against my template. As you can see, I played around with a few different fabrics for the feathers but in the end I went with red and purple, adding some gauzy gold over this to give it some extra sparkle. The raw-edge technique worked fairly well for this part of the process, but when I came to do the gold details on the head and crest, the pieces of gauze were so tiny they began to disintegrate! I ended up using tiny whip-stitches instead and it took forever! I realised at this point that if I want to do more of this stuff, a serious brushing up on my hand-sewing and embroidery skills is needed… (more on that in a minute)! But at last, the hand-stitching was done and I pinned Mr Phoenix into place on my background fabric, a lovely pale orange cotton given to me by my mum, with a backing tissue underneath. I had a play with some different stitches on the machine and decided that a tiny satin stitch would prevent the fabric from fraying but still enable me to maneouvre around all those detailed edges without obscuring them. I hit problems straight away as everything started moving around too much, so I had to ditch the pins and hand-baste the applique to the background instead. See how neatly that satin stich goes around the curves along the bottom piece of my stitch tests above? Oh, if ONLY I had known what awaited me… The first wing section seemed to go OK when I was machining it, but when I took it out, I thought at first my stitches must have failed to catch in the edge of the fabric. I painstakingly unpicked several sections and did them again. Only when the same thing happened again did I realise the terrible truth: the edge of the fabric was disintegrating as soon as the needle touched it!! You can see on both the top and bottom pink/orange sections of the wing where I had to stitch over them twice, making an horrible lumpy mess. Even then, I had to go back and catch some of it under by hand as it began to come apart before I was through stitching! The tail feathers ended up being such a mess that I gave up on using the machine at all. I cut some more pieces from the gold gauze and stitched them on by hand to hide the worst of it! After all that effort, I must admit I was disappointed. I’d used bondaweb on the psychedelephant quilt and had no problems machining around the cotton at all, so I can only conclude that it was either the interfacing I used, or that the batik fabric in particular was just not very good quality. HOWEVER, I am happy to report that the finished piece really doesn’t look half bad – as long as you don’t look too close! The banner made a great focal point for our stall at the Show and I had some nice compliments, too – always a boost! I have plans to make a patchwork border for it at some point and maybe add a few more bits and pices. Making this was definitely a Learning Curve, and I really did enjoy the process – despite that Sinking Feeling when I started machining! But it’s encouraged me to go off and do an online course to learn some new techniques, which I’m LOVING and will be ready to share with you soon! Ready…?? Whoo-Hoo! I LOVE IT!! In fact, I love it SO much that although it’s not yet A Quilt, I’ve already hung it up in the space it’s intended for. I have a rather huge, rather grottily-sealed-up, draughty fireplace in my living room, which despite its shortcomings has a beautiful old lintel above it, so I wanted something that would cover the fireplace itself but still allow me to make a ‘feature’ of the lintel. I’m going to sew a hanger-sleeve into the quilt backing so that I can put it across, but for now I’ve just tucked it under the big blanket that’s currently hanging there. No-one could say it’s not eye-catching! !